A rose by any other name would smell as sweet. Shakespeare was onto something back in 1600 AD, when he penned that famous Romeo and Juliet line. Its import intimates that its not the name of things that matter, it what those things really are. 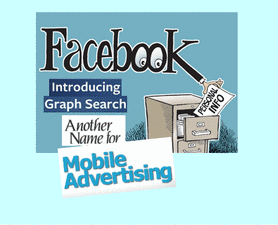 With the launch of Facebook's "Graph Search" on January 15, 2013, it's important to discern that FB's answer to a 'search engine,' is really it's portal to mobile advertising. Mark Zuckerberg and his team have been working relentlessly to capitalize on their 1 billion users, and attract major advertisers ever since its May 2012 IPO launched with lackluster results -- and dropping more than 50 percent to a record low of $17.55 on September 4, 2012. Quick to couch his graph search launch message in altruistic hyperbole, Zuckerberg quips that "Facebook's mission is to make the world more open and connected" and "we give people the tools to map out their relationships with people and things they care about." Yet, you don't have to go far to understand that Zuckerberg is beholding to his Board of Directors on the micro level and his shareholders on the macro level. And a substantial ROI is required for the world's largest social network to continue to thrive in the 21st Century. Building a search engine that initially searches its "users" versus the "Web" is a blatant move on Zuckerberg's part to use those searches to define user preferences and then offer them up to mobile advertisers. And while Zuckerberg is known for taking two steps forward before taking one step back, he has already assured his users that his graph search was designed with "privacy in mind" where each searcher will only see results curtailed to them. What he purposely failed to mention were the thousands of brands queing up for dibs on that same data. In 2010, with the release of the graphic novel, "Facebucks & Dumb F*cks," this satire follows Zuckerberg's journey from the hallowed halls of academia where he callously labeled his followers "dumb f*cks" to the techie haven of the Silicon Valley -- with always one goal in mind -- to rule the Web! When only at a half billion "dumb f*cks" at the time, here Z-Man (aka Mr. Zuckerberg) is lampooned liking every object on the planet, in essence to lay claim for future advertising revenues. Previously, I indicated that FB's graph search will initially search its users versus the Web. That's true. But Z-Man is also hedging his bets. In the instances when its search results come up empty from one's followers, it will be collaborating with Microsoft's Bing to dig deeper. Drawing a line in sand with Google (the Grand Daddy of search engines), when "Graph Search" can't find what you're looking for, it's Bing to the rescue. The results in those cases will be drawn from the Web and morphed into one's social graph over time. 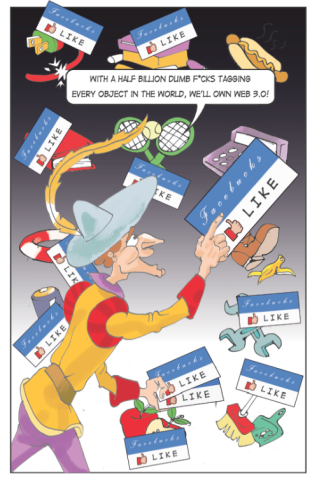 Time Magazine's Harry McCracken in his report, titled "Facebook's Graph Search Is the Future of Facebook," also connected the dots when it came to Facebook's lucrative advertising goal. He notes, "if it takes off, and people start using Facebook to find restaurants, doctors, travel destinations and much more, it’s tough to imagine a scenario in which the site doesn’t make enormous amounts of money from precisely-targeted advertising. It could rival Google as a money machine on a level it hasn’t done to date." With the "Internet of Things" fast becoming a reality, Facebook's timing couldn't be any better. 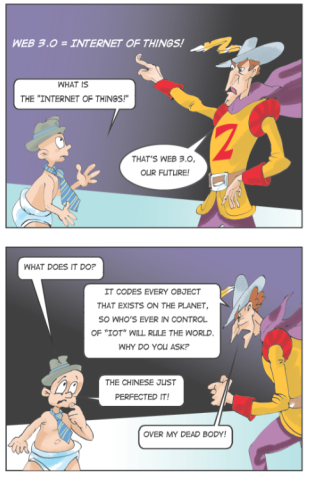 Also called "semantic technology" and what some have labeled the "new industrial revolution," the IOT is where wireless networks of objects are created using RFID, Bluetooth, GPS, and other technologies, working in tandem with cloud computing environments, Web portals, and back-end systems that will allow our 'things' to talk to each. And the Chinese are currently leading the Western World in the advancement of this technology. So perhaps Mr. Zuckerberg would be better served in calling his new search engine what it really is -- a means to capitalize on his "dumb f*ck" followers and their preferences, which will eventually become attached to everything else around them. After all, a rose by any other name could garner exponential ROI in the very foreseeable future! And for Z-Man, how sweet will that be? Changes are frustrating- you just think you're starting to make sense of the last lot of changes, and another one comes along that you need to get on top of. It's also intensely frustrating to find out that now most of your posts won't get seen by others who have 'lliked' your page. Having said that, and cynicism as to the real purpose of this change aside, I can see how this change encourages everyone to be a lot more interactive and less passive in their use of Facebook; and to concentrate on quality and relationships rather than quantity. Here on EA we get involved in so many missions - a lot of it excellent material - and not only clog up our own pages but also those of everyone who has liked us - and some of them DO NOT LIKE THAT. I'm not looking forward to getting up to speed on the best way to do things from here on, but I think it will be a change for the better for all - individual facebook users, their 'friends' and 'likers', the overall facebook experience and community, the marketers, and the shareholders. Where all of this data mining is taking us raises lots of questions. It may seem benign to many but in the future those who control this will as the cartoon suggests "rule the world". Though I know this approach is necessary, it will take me a bit to get used to it and potential rewards. The whole issue FaceBook has now is how to monetize their site with shareholders to please. And of course likes and what they show about users page visits and preferences are some of the only "coin" that is unique to them. So something like Graph Search had to come to make likes even more useful for users as that's a sell-able commodity for FaceBook. 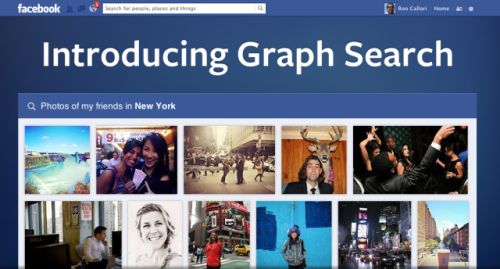 That makes Graph Search a tool that FaceBook had to develop in one from or another. Now lets see if users use it enough that ad sales make FaceBook the revenue they need to shore up stock prices. Data is king. Users are pretty powerless when it comes to these huge platforms and their "updates" changes etc. Must be nimble and take all the change in stride. What's the point of all this data being online anyway? Putting aside the business aspect? But of course the business aspect is here and so we shouldn't be surprised that we are part of the product. Why are we surprised that we get something for free and then we are part of the product of this business? If you don't like it you can always get off the train. I don't mind targeted advertising. Las Vegas figured that scheme out a couple of decades ago - find out what the customer likes and tailor your offerings to their preferences. You give up some privacy, and (theoretically) get better service in return. What concerns me about Facebook Graph Search are the potentially nefarious utilization by those that are looking to harm rather than streamline commerce. Puuuh bad Facebook hit back!??! I already start to hate the ads in my timeline and may this be another reason to have a look to G+? More than a theory - you are correct! This definitely a subject I need to learn to utilize the power that is FB. New rule: if you getting something for free, you're not a customer - you're the product. Great post. I found it very interesting and ironic that Zuckerberg aka ZMan refers to his ultimate FB customers as "dumb f*ck" followers. It is interesting to watch the continual churn from the SoMe giant in order to outadvertise the competitors. I just wonder how long the lambs will continue to blindly stumble down the road to the FB slaughterhouse. The flap over change will continue, but you're using FB for free ... you get what you pay for.